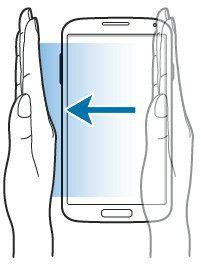 Use palm motions to control Galaxy S4 by touching the screen. 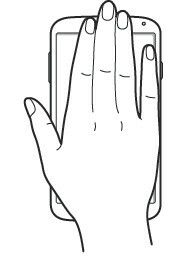 Before using motions, make sure the Galaxy S4 palm motion feature is activated. On the Home screen, tap Apps → Settings → My device → Motions and gestures → Palm motion, and then drag the Palm motion switch to the right. Sweep your hand across the screen to capture a screenshot. The image is saved in Gallery →Screenshots. It is not possible to capture a screenshot while using some applications. Cover the screen with a palm to pause Galaxy S4 media playback. Often, a simple reboot will solve the problem. In most regions, if you can register your warranty online, it should be genuine. If after restart your phone, the problem persists, you can always visit local Samsung service centre to check your phone whether there are any hardware issues. It has nothing to do with web browser. Did you enable palm motion? For screenshot, both methods works for At &T after 4.3 update.